It damps pulsations from the discharge line of a reciprocating compressor, resulting in an essentially steady flow of air in the system. It serves as an air reservoir to take care of sudden or unusually heavy demands for air in excess of the compressor’s designed capacity. It prevents the excessive cycling of a compressor. It knocks out solid dirt and particulate matter that may have passed through the compressor inlet filter or may be formed by compressor wear. During the compression of air in a reciprocating compressor, the air is delivered in pulses through the discharge line. This is caused by the alternating suction and compression stroke of these types of compressors. Adding an air receiver tank dampens these pulses and allows a smoother delivery of air to the tool or piece of equipment being used and helps protect hoses and components from damage caused by pressure spikes. 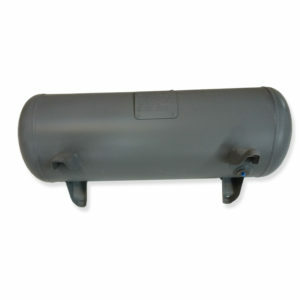 The air receiver tank is capable of storing compressed air to be used once the compressor has been turned off or to offset sudden, heavy demands of air. If sized appropriately it may also allow the use of a smaller compressor in applications requiring higher airflow than the compressor can continuously deliver but at low duty cycles. As mentioned above, the tank can store air and act as a buffer. This also allows the compressor to cycle on and off less frequently, which can reduce wear and tear and reduce energy consumption. Care must be taken to ensure that the compressor system is rated and able to run long enough to fill the size of tank chosen without overheating or causing accelerated wear. During compressor operation dirt, wear particles, or other foreign matter may bypass the air filter or otherwise find its way into the compressed air stream leaving the compressor. When using a receiver tank, some of this material will naturally fall to the bottom of the tank. Debris in the airstream can cause blockages, premature contamination of filters, and excessive wear of air using tools and equipment. Atmospheric air typically contains moisture that is drawn into the compressor during its intake cycle. The moisture holding ability of air is a function of temperature and pressure and as air is compressed its temperature rises. The hot, compressed air typically holds the moisture in a vapor state but it will start to condense into liquid form as the air starts to cool past its saturation point. 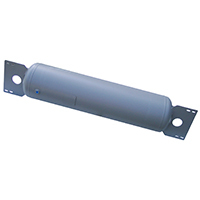 Air receivers are typically uninsulated so when the hot compressed air enters the receiver tank it cools by transferring heat to the environment through the walls of the tank. When this happens in an airline (rubber hose is a pretty good thermal insulator) without an aftercooler or a reservoir tank to capture it, it is commonly seen as liquid water coming out of your tools or equipment. With the reservoir tank, much of this liquid is collects in the bottom of the tank where it can be drained out. This is the main reason why it is recommended that receiver tanks be drained regularly; if this is not done the tank may rust on the inside. Hopefully, this has given you an overview of the benefits of adding an air receiver tank to your compressor system. 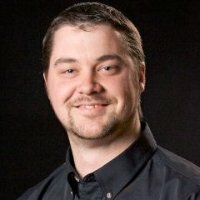 The details on selection and integration are beyond the scope of this post and should be discussed with your air system supplier. If you have any questions about this article or anything mobile compressor related, please get in touch!.